At Intellect, we want to empower everyone to innovate and help you change the way you do business. 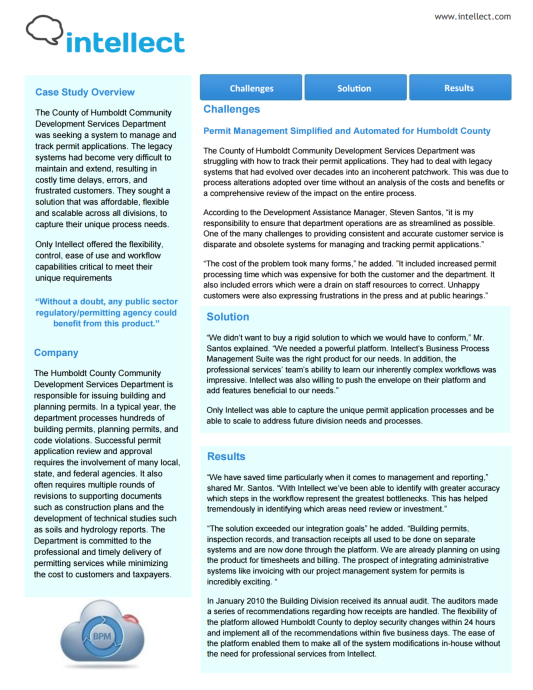 Download The Humboldt County Automated Their Permit Management Processes With Intellect case study and learn how Intellect simplifies and automates Humboldt County's permit management. Challenges The County of Humboldt Community Development Services faced included struggling with how to track their permit applications and finding the best solution to streamline their system. Results after using Intellect exceeded expectations. Building permits, inspection records, and transaction receipts is now integrated in one platform.